The New York Yankees lost a well-known name from their organizational depth chart this weekend. 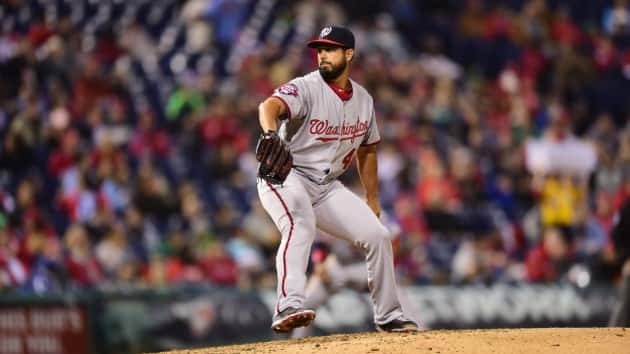 Veteran southpaw Gio Gonzalez exercised the opt-out clause in his contract and became a free agent, the Yankees announced Monday. As it turns out, Gonzalez might not have to look outside New York to find his new employer. The New York Mets, arguably already in need of another starter and now without ace Jacob deGrom in the short term, are scouting Gonzalez’s start Friday night and could have interest if and when he opts out. Gonzalez joined the Yankees last month on a minor league deal that included $3 million in base salary if he was added to the 40-man roster and a chance to earn $9 million in performance bonuses. He went 2-1 with a 6.00 ERA in three starts covering 15 innings at Triple-A Scranton/Wilkes-Barre. He had 19 strikeouts and six walks. While the 2018 season certainly wasn’t one of Gonzalez’s best, he topped 170 innings and 30 starts for the eighth time in the past nine seasons, working to a 4.21 ERA with 7.8 K/9 against 4.2 BB/9 along the way. Gonzalez has averaged 31 starts per season dating back to 2010 and hasn’t made fewer than 27 appearances in a given season since that time. As recently as 2017, he notched a 2.96 ERA in 201 innings of work, though he did lead the National League in walks that season. Nevertheless, Gonzalez has regularly been an average or better starter in the Majors for the past decade; that strong track record made it nothing short of bewildering to onlookers that he faced such a seemingly minimal market, but he’ll now venture into free agency for a second time with new representation as he looks to find a quick path back to the Major Leagues. The Buffalo Bills have added another body to the most interesting running back room in the NFL. The Bills announced on Monday morning the signing of former Jacksonville Jaguars running back T.J. Yeldon on a two-year deal. The Bills have been active in free agency, adding several new offensive players, including Gore, wide receivers John Brown and Cole Beasley, tight end Tyler Kroft and offensive linemen Mitch Morse, Spencer Longand Quinton Spain. 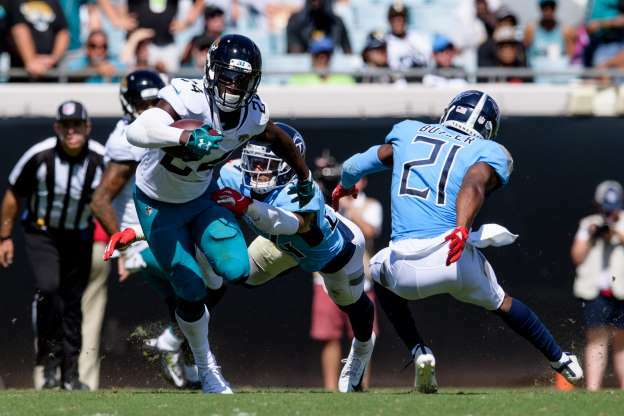 The 25-year-old Yeldon didn’t do much the second half of the 2018 season, carrying the ball 23 times and catching 18 passes in the final eight games. 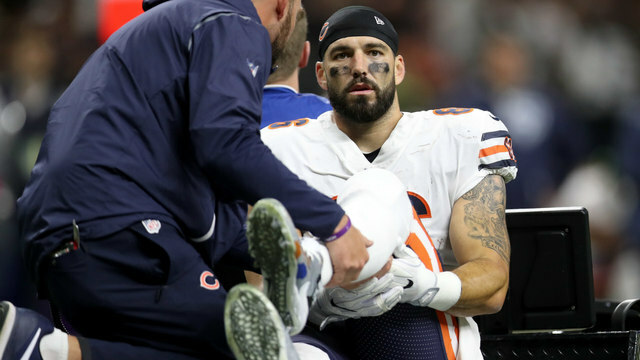 He was a much bigger part of the offense in the first half of the season, when he started in place of Fournette, who missed six games because of a hamstring injury. The Jaguars drafted Yeldon in the second round (36th overall) of the 2015 draft and he led the Jaguars in rushing as a rookie with 740 yards despite missing four games with an injury. He finished his four years in Jacksonville with 1,892 yards and six rushing touchdowns and 171 catches for 1,302 yards and six touchdowns. He joins a Buffalo backfield that already includes veteran running backs Frank Gore and LeSean McCoy. 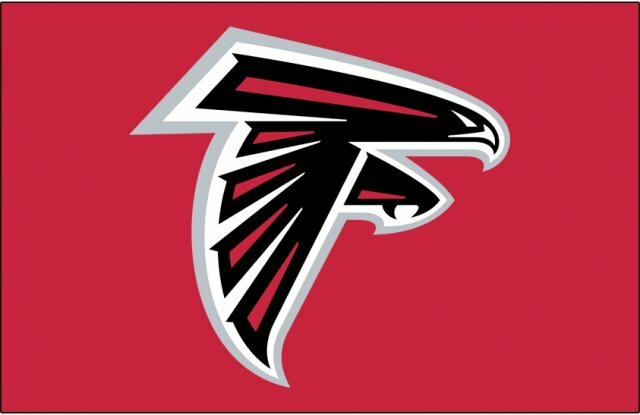 The Atlanta Falcons have re-signed former 2014 second-round draft pick Ra’Shede Hageman, whom they released in 2017 following domestic violence charges, to a one-year contract. Hageman, who served a six-game suspension as a result of those March 2016 charges, now faces a two-game ban at the start of the 2019 season for a violation of the league’s substance abuse policy. Hageman was arrested for driving while impaired last June. Falcons general manager Thomas Dimitroff and coach Dan Quinn said the team was willing to give another chance to the 28-year-old Hageman. Quinn also supported the decision to give Hageman another chance. Hageman, last listed at 6-6 and 318 pounds, could provide much-needed depth to the interior of the defensive line, provided he makes the roster. The Falcons already added a potential starter at defensive tackle next to star Grady Jarrett with the signing of Tyeler Davison to a one-year deal. The other interior defensive linemen include Jack Crawford and Deadrin Senat. Hageman started 16 of 44 games during his first stint with the Falcons and compiled four sacks to go with 21 tackles. He was known more for his strength and ability to push offensive linemen around. Yet another impending free agent has signed a contract extension and taken himself off the market. 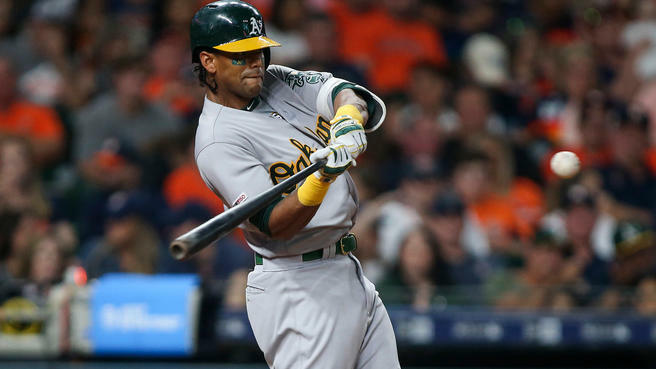 Thursday afternoon the Oakland Athletics announced they have signed slugger Khris Davis to a two-year contract extension covering the 2020 and 2021 seasons. The two-year deal is worth $33.5 million, according to Susan Slusser of the San Francisco Chronicle. The $16.75 million average annual value represents a slight raise from his $16.5 million salary this year. “Oakland has been a special place for me since I arrived,” Davis said in a statement. “I love playing here in front of our fans, and my teammates make this feel like a family. I never hid the fact that I wanted to stay in Oakland because that is how I feel and I’m glad that I can continue to call the city of Oakland my baseball home. This team has a bright future, and I’m thrilled to be a part of it.” Davis, 31, has emerged as one of the top home run hitters in baseball since joining the A’s in a three-player trade with the Brewers in February 2016. He hit at least 42 home runs each season from 2016-18, including an MLB-leading 48 homers last year. Davis leads baseball with 10 homers in the early going this season as well. Funnily enough, Davis has hit exactly .247 in each of the last four seasons, which is a neat statistical quirk. He owns a .260/.305/.662 batting line in the early going this year. Davis has been primarily a DH since the beginning of last season, which suits the roster and his game well given his shaky defense. There’s nothing wrong with having a pricey and productive DH. With Davis locked up, the Athletics figure to explore a long-term extension with third baseman Matt Chapman in the near future. He can not become a free agent until after the 2023 season, so it’s not an urgent matter, but the sooner they lock him up, the bigger the discount. That’s how these extensions usually work. Lucas Giolito will miss some time after straining his hamstring in Wednesday’s game. The White Sox placed the right-handed starting pitcher on the 10-day injured list ahead of Thursday’s series-opener in Detroit. They also brought up relief pitcher Carson Fulmer and outfielder Ryan Cordell to take the roster spots of Giolito and outfielder Daniel Palka, who was optioned to Triple-A Charlotte on Wednesday night. Giolito exited Wednesday’s start after just 2.2 innings after tweaking his hamstring on a third-inning pitch. He was doing quite well in his second start of the season against the Kansas City Royals, with five strikeouts and no hits allowed before his early departure. 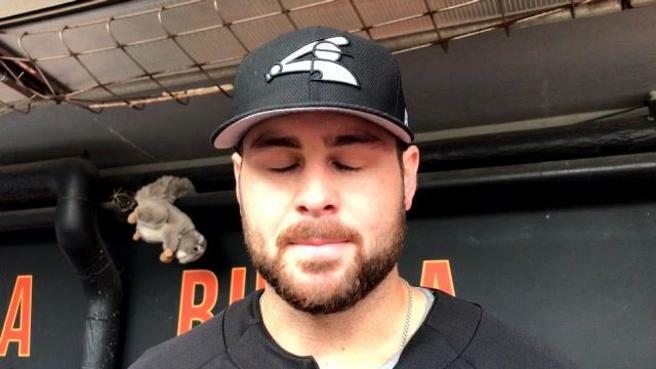 Giolito spoke with reporters Thursday morning in Detroit, saying the strain isn’t too serious and that he expects to miss just one or two starts. As for who will start in Giolito’s stead, that remains to be seen. His turn in the rotation won’t come until Monday’s game that begins a series against the Baltimore Orioles. Fulmer arriving from Charlotte, however, points to Manny Banuelos being taken out of the major league bullpen to start in Giolito’s place. Banuelos has had success as the White Sox long man so far this season, with a few effective multi-inning outings under his belt. Fulmer hasn’t made a start since the White Sox moved him to the Charlotte bullpen last season but could serve as a replacement long man in the short term. This is Fulmer’s second call-up this season, he was on the roster for one day earlier this month, pitching three innings of relief against the Tampa Bay Rays. Meanwhile, Cordell arrives to take the place of Palka, who picked up his first hit of the season Wednesday after starting in a dreadful 0-for-32 slump. He was sent down after the game with the task of figuring things out at the Triple-A level. While the White Sox could have opted to slide Adam Engel into an everyday role in the big league outfield, it appears Cordell might get his shot at more frequent big league playing time. He was in the starting lineup for Thursday’s game against the Tigers. Cordell made the Opening Day roster but only got six at-bats (homering in one and doubling in another) and was sent down to receive some more regular playing time, which he might now get in the majors. For far too many years, the Cleveland Browns only got the mandatory one national prime-time game on the NFL schedule, usually a Thursday Night Football matchup that meant little. Those days are long gone. The 2019 Browns will be featured in prime-time games four different times. That’s right; one quarter of the Browns games will be nationally televised. 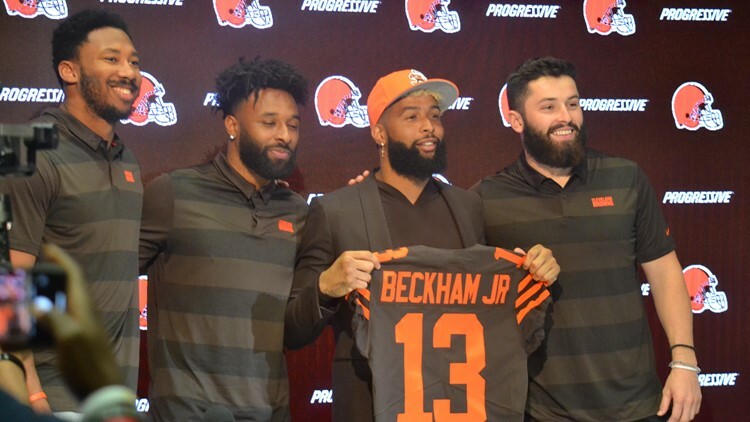 The football-watching public cannot get enough of Baker Mayfield, Myles Garrett, Odell Beckham Jr. and the exciting young Browns under Freddie Kitchens. The first national look comes in Week 2 when the Browns visit New York for a Monday Night Football date with the Jets. Six days, err, nights later, the Browns host the defending NFC champion Los Angeles Rams in FirstEnergy Stadium for a Sunday Night Football affair. It will be the first time the Browns are featured on NBC’s Sunday night broadcast since the 2008 season. Week 5 sees the Browns make a repeat appearance on Monday Night Football. This time it’s in Levi’s Stadium against the San Francisco 49ers. The final prime-time game brings the Pittsburgh Steelers to Cleveland in Week 11 for a Thursday Night Football matchup under the lights. That game is the middle match of a 3-game homestand that also sees the Buffalo Bills and Miami Dolphins make the trip to FirstEnergy Stadium. There is a chance another late-season game could be flexed to prime-time if the Browns and the foe are both in playoff contention. Week 16 against the Baltimore Ravens could very well fit that bill, but we won’t find out about that until well into the season. The NFL will open the regular season, the 100th in its history, on Sept. 5 with the 199th meeting between the Green Bay Packers and Chicago Bears at Soldier Field. The Super Bowl LIII champion New England Patriots will open at home on Sept. 8 against the Steelers on Sunday Night Football. Barcelona are nearing an agreement with Ajax for wonderkid Matthijs de Ligt, who is said to be convinced to make the move to the Camp Nou. The 19-year-old has attracted interest from many of Europe’s biggest clubs as a result of his impressive performances in the Champions League. Teammate Frenkie de Jong sealed a €75m switch to Barcelona in January, and De Ligt could soon follow. The Blaugrana are keen to remain on good terms with Ajax and do not want to disrupt their progress in the ​Champions League, after De Godenzonen reached the semi-final of the competition with a dramatic 2-1 win over ​Juventus on Tuesday. Club president Josep Maria Bartomeu has previously confirmed to ​ESPN that he knows what will happen with De Ligt, but insisted that nothing will be said until the summer. Barcelona are said to be ready to part with around €80m to sign the 19-year-old in the summer, and they will finance the deal by selling a handful of players on the fringes of the first team. They are looking to raise around €300m, and could part with the likes of Philippe Coutinho, Samuel Umtiti and ​Ivan Rakitic in order to reinvest in the squad. A number of players will leave Camp Nou in the postseason to fund the moves for De Jong, De Ligt and potentially another forward and a left-back. The Spanish champions are well covered in the centre-back positions. Gerard Pique and Clement Lenglet have been in great form this season, while Samuel Umtiti has just returned from injury. Jean-Clair Tobido, a January signing, is also tipped to have a big future in the game.Thomas Vermaelen, though, will leave for free in the summer and Barca do not plan on exercising an option to make Jeison Murillo’s loan deal permanent, creating space for one new defender. 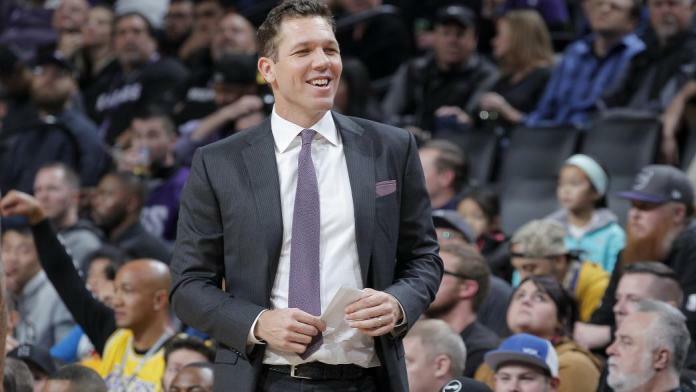 Only three days after his time with the Los Angeles Lakers came to an end, Walton was announced Monday as the new head coach of the Sacramento Kings. In Sacramento, Walton replaces Dave Joerger, who was fired after three seasons. Terms of Walton’s agreement with the Kings were not disclosed. Walton, after 11 years as an NBA player, rose to coaching prominence when he filled in for Steve Kerr as the interim coach of the Golden State Warriors during the 2015-16 season. After the season, he was hired by the Lakers, the team he spent nine seasons with as a player. In his three seasons, Walton had a 98-148 record as he attempted to oversee the franchise’s rebuilding effort — one that was filled with dysfunction. Walton, 39, was expected to be fired by the Lakers once the regular season ended, but the abrupt resignation of Magic Johnson put Walton’s impending exit on hold for a few days. On Friday, the Lakers announced that they “mutually agreed to part ways” with Walton. Walton was quickly identified by Divac and the Kings as the man to develop their talented young roster and get the team back to the playoffs for the first time since 2006. In Sacramento, Walton inherits players like De’Aaron Fox, Marvin Bagley and Buddy Hield. The Kings were in playoff contention for much of the year, but lost 17 of their last 26 games to finish 39-43, their best record since ‘06. Russell Wilson is sticking around with the Seattle Seahawks as the highest paid player in the NFL. Wilson posted a video on Twitter on Tuesday morning saying, “Seattle, we got a deal”. His agent, Mark Rodgers, said the deal is a $140m, four-year extension with the Seahawks. Wilson’s new contract runs through the 2023 season and includes a $65m signing bonus, a no-trade clause and $107m in guaranteed money. Wilson’s per year average of $35m tops Aaron Rodgers’ average annual salary of $33.5m as part of the $134m extension he signed last year with the Green Bay Packers. The deal ends the debate about Wilson’s future with the Seahawks, although there seemed to be little doubt he would remain in Seattle for a while. The team held leverage knowing it likely had at least three more seasons with Wilson under center. 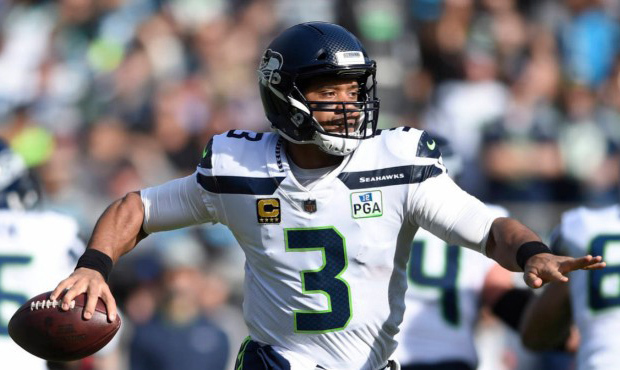 Even if he played out 2019 under his current deal, Seattle could have used the franchise tag if needed to keep him under contract through 2020 and 2021 at a reasonable price by quarterback standards. But the extension allows Seattle to budget for the future knowing how to work with Wilson’s hefty paycheck in the years ahead and build a contender around the former third-round pick that has developed into a franchise QB. The 5ft 11in Wilson has shelved the stigma of short quarterbacks being unable to play in the NFL. He’s also been extremely durable, never missing a game while playing through significant knee, ankle and shoulder injuries.